Talk about creative! 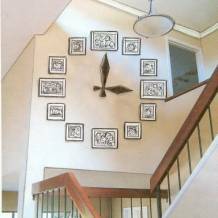 This unique photo display features 12 framed images that are lined up to form a circle that creates the look of a clock and then 2 large hands are perfectly centered in the middle to create the full affect of a "photo clock". For a large space this is a magnificent and creative idea! 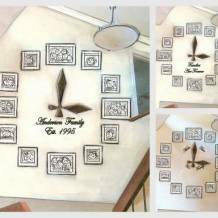 To keep a cohesive look all the photos are black and white in black frames with white mats. The frames will all be the same size excluding the 12,3,6 and 9 spots which will be the same frame just in a larger size. 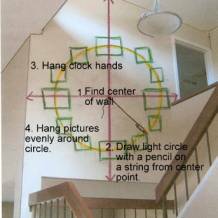 The idea can be carried into any room of course - and as with any photo wall we suggest you lie out the design on the floor first to figure out your circular dimensions which you can then transfer to the actual wall. Here is the same wall with the inclusion of some wall text of the family's name and year....there are just so many options for this idea!